An inexpensive ball can keep him busy and happy for a long time. Active little boys enjoy items that allow them to run, jump and release energy. You can buy various types of inexpensive balls for young boys, such as plastic balls they can kick, throw, bounce and chase. Consider foam balls because the little one could forget that such items shouldn’t become projectiles in the house. If the boy enjoys T-ball, you could get a catch set that uses a fabric hook pad on the palm of a glove that attaches to loops on the ball, making it easier to catch. For another option, consider a foam basketball he can shoot into a basketball hoop you can place down at his level. Inexpensive toys and activities for inside play could make an active 3-year old smile. He could enjoy blocks, trucks, cars and action figures. You could also consider a small inflatable punching bag to help him deal with anger and work off some excess energy. He could enjoy his own set of tools to build his fine motor skills and pretend to help fix things around the house. 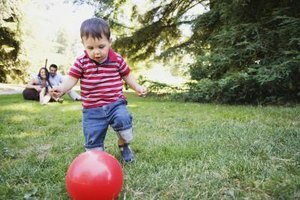 You can find some interesting and inexpensive toys and activities that keep an active little boy busy outdoors. A container of bubbles with an assortment of wands allows for hours of fun. A water gun or a pack of water balloons can provide the ammunition for an energetic game of battle. Buckets, shovels and sturdy cars can keep him busy in a sandbox or at the beach. He could chase and observe bugs with a clear plastic box and a small net. A 3-year old boy could enjoy tickets to entertainment venues that allow him to be active, such as admission to a children’s museum, kids’ clubhouse, children’s learning center or an amusement park for young children. Hands-on children’s exhibits allow him to experience learning in a safe and fun environment. There are usually enough exhibits and activities to keep him busy for hours. His parents could thank you for finding such an interesting and enjoyable way to spend a day.